An agreement to the size of EU budget for the period 2014-2020 has been reached. Speaking immediately after the deal was struck, here is what key decision makers had to say about the budget and development aid. Jose Manuel Barroso, the President of the Commission said of the deal, “we kept commitment to development aid and humanitarian aid” focusing support to “poorest countries”. Herman van Rompuy, President of the EU Council spoke felt that “this budget will allow Europe to keep engaging on vital global issues, such as…development aid”. Media outlets from across Europe are setting up in Brussels as EU leaders meet over the shape of the EU budget for the next seven years. EU leaders are set to be presented the latest EU budget proposal by EU Council President Herman Van Rompuy at 3pm today. With EU leaders set to come together at the next EU summit tomorrow to break the EU budget deadlock, European development NGOs have been pushing to make loud and clear the voices of those who are most often ignored in these discussions. CONCORD issued a press release warning the EU against cutting EU aid, a stance that has been supported by Martin Schulz, President of the European Parliament. MEPs in a cross-party declaration have also issued a statement on the eve of the EU summit encouraging national leaders not to cut the EU aid budget. Meanwhile, the media such as The Guardian, DevEx and EurActiv have been covering us and our members’ efforts to speak out against EU aid cuts. EU leaders will meet again on 7-8 February to discuss the EU budget 2014-2020, following a breakdown in talks last year. Development NGOs are following this process closely and hope that a Council agreement will provide sufficient funding for development and humanitarian aid as proposed by the European Commission and the European Parliament. We call on EU leaders to protect EU aid in the budget negotiations taking place this week. Share and Tweet the infograph below. The hashtags are #MFF and #EUCO. The EU budget summit has ended without agreement. This means that EU leaders will have to meet again to hammer out a deal. A very brief statement by the EU Council talks of “potential” agreement in the beginning of 2013. The delay may give some time for EU leaders to have a rethink on aid cuts. EU leaders should recognise the danger cuts can mean to the lives of some of the poorest people. Development NGOs have issued a press release warning EU leaders that they are overlooking aid in budget negotiations, with large cuts targeted at development and humanitarian aid. Martin Schulz, President of the European Parliament, is the latest high-level figure to join calls for protecting EU aid from the budget cuts. Keen to impress on the European heads of government of its importance, Schulz’s speech to EU leaders made reference to Concord’s analysis that European aid only costs €1.87 per EU citizen during a speech at the ongoing EU summit. drawing attention to the fact that the current suggested cut is disproportional in relations to cuts in other budget items. EU leaders are meeting in Brussels on 22-23 November to decide the future budget for 2014-2020. At stake is the part of the budget dedicated to development and humanitarian aid. CONCORD and many NGOs are urging EU leaders not to make shortsighted cuts to precious aid support that helps millions of the poorest people. Following NGO calls that aid cuts in the next seven year budget could cost lives in developing countries, Jose Manuel Barroso, the European Commission President, stepped forward to defend EU aid ahead of the EU summit. Addressing the European Parliament on 21 November, the Commission chief said that aid cuts were “a question of life or death” for the vulnerable in developing countries. Some media such as the Parliament Magazine, reported that Barroso was now on a ‘collision course’ with EU Council President Herman Van Rompuy on the aid cuts issue. Van Rompuy will chair meetings to negoatiate the EU’s next budget for 2014-2020 amongst EU leaders. CONCORD was disappointed last week to see that Van Rompuy proposed substantial cuts to development and humanitarian aid as part of the new budget deal, as reported in the Guardian newspaper. We then helped mobilise some 2000 European NGOs to send a letter to the four European countries that are taking a lead in standing up for aid commitments; Sweden, Denmark, the United Kingdom and Luxembourg, that form the G.07 group. We then made a further call in a joint press release from CONCORD, Oxfam, Plan and ONE, highlighting the risk of the EU ‘balancing its books on the backs of the poor’, covered by international news agencies such as AFP. All eyes are now on EU leaders to see what agreement, if any, they’ll come to. 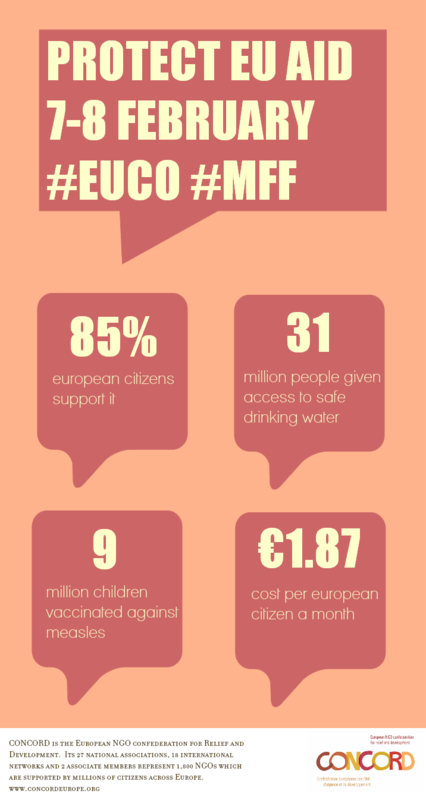 Over 31 mil ppl connected 2 drinking water between 2004 & 2009 thanks 2 EU #aid – it must not b cut from nxt #EUbudget! €10bn EU #aid could feed 5.2 mil families of 6 for a yr. This money can’t be cut from nxt #EUbudget!